In this research area, ACMIT’s goal is to develop multiple, non-invasive, single to multi-parametric sensing systems and components, which can be applied as stand-alone systems or as part of a complex instrument. Sensor selection, parameter analysis, and design are followed by prototype development in order to validate and optimize the concepts in experimental setups. Special interest is on remote and online monitoring of wound healing, wound closure, and tissue specification. As a second focal point, research on micro-optics aims to investigate, design and simulate micro-lenses for different medical purposes, e.g. in intraocular implants or surgical instruments. Remote monitoring of the status of selected tissue or of a wound may help to optimize treatment. 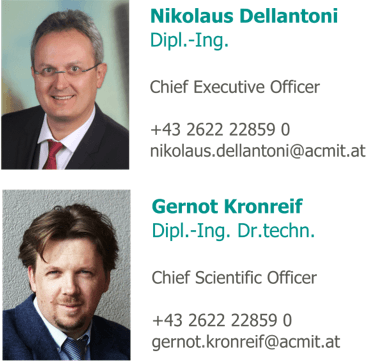 ACMIT develops sensor components for wound dressing, integrated systems as well as micro-fluidic platforms for assessment of biochemical tissue parameters. Development of a detection system for tracing of volatile substances and utilization for tissue characterisation in selected applications. diffractive micro-structures to achieve miniaturized elements as well as extended optical features. In general, sensor technologies have the potential to provide medical personnel with additional information on the area of interest, which finally may help to improve therapy and contributes to efficiency and safety. Particular focus is on multi-parametric sensors that are able to measure various parameters in parallel.